The average water level of many parts of the Red River has remarkably reduced in recent years, badly affecting agricultural production and the living conditions of residents in the northern lowland and midland areas. The level in some sections is two metres lower than the previous 20 years. The level in some parts reached the lowest point of 2.2m, causing difficulties for irrigation work, said experts at a conference held in Hanoi on Wednesday to assess the impact of lower Hồng River water levels and to discuss solutions. According to Ha Duc Trung, Deputy Director of the Hanoi’s Department of Agriculture and Rural Development, irrigation systems along the river were built a long time ago, when the water level was still high. But now many pumping stations cannot operate because the water is too low. Phù Sa pumping station in Hanoi’s Son Tay Commune, for example, was designed to meet water levels of 5.2m but the water level of Hồng River flowing through the commune now only reaches 4.8m. To ensure enough water for 630,000ha of rice of 12 localities in the midland and lowland areas, the Ministry of Agricultural and Rural Development has annually co-operated with the Electricity of Viet Nam to take water from hydropower reservoirs as a supplement. 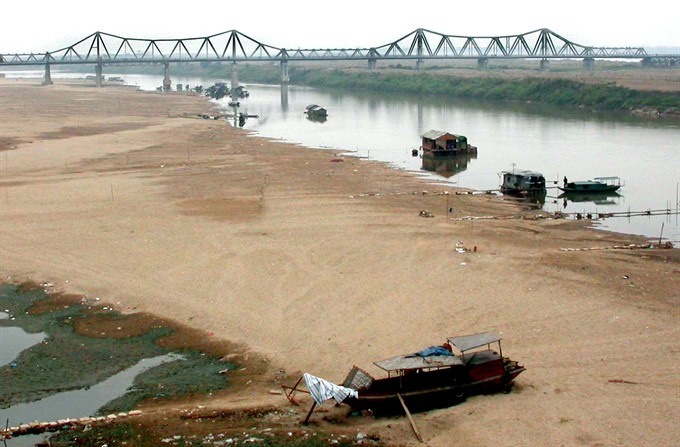 Deputy Minister of Agriculture and Rural Development Hoàng Văn Thắng said the reduction of the water level of Red river over the past years badly affected agricultural production and daily activities of residents. Thang urged the Viet Nam Academy for Water Resources to promptly review the situation, particularly the depression of the river bottom and sand exploitation to report to the Government and relevant ministries to have appropriate solutions. Professor Ha Van Khoi, former lecturer of the Hanoi-based University of Water Resources, said one important measure would be to better manage the operation of reservoirs upstream to reduce the level of river bed erosion. Other participants said the river flow changes should be taken into consideration. Irrigation works, pumping stations and dam systems in Hanoi no longer meet the current situation of the Red river. The irrigation system was downgraded as many pumping machines were built since 1960 and reached about 70 per cent of their performance.